Portland, Oregon, December 01—The weather may have been damp and cool, and the ground a little muddy, but that didn’t keep the top high school runners at the 14th NXN Nationals from running the fastest times ever on the course at Portland’s Glendoveer Golf Course, where it has been held the last 5 years. The boys race looked like an anybody-can-win affair for the first mile as the leaders ran up to 10 abreast on the gentle curves of the course and no one seemed to want to surge away from the crowd. Instead, a battle for attrition played out. At 1M (4:43) about 21 runners crossed before the clock read 4:44. By 2M (9:44), Nico Young (Newbury Park, California) led a pack of 15, with Liam Anderson (Redwood, Larkspur, California) on his shoulder. At 1K to go, Young and crosstown rivals Easton Allred (Mountain Vista, Highlands Ranch, Colorado) and Cole Sprout (Valor, Highlands Ranch, Colorado) moved hard. Anderson smoothly bridged the gap and moved ahead with a quarter to go. The contrast in styles made all the difference. While the others visibly showed their effort, the Stanford-bound Anderson maintained a smooth, machine-like stride that gave him an edge on the final hills. The margin between Anderson—the top returnee at 3rd last year—and his pursuers continued to grow. 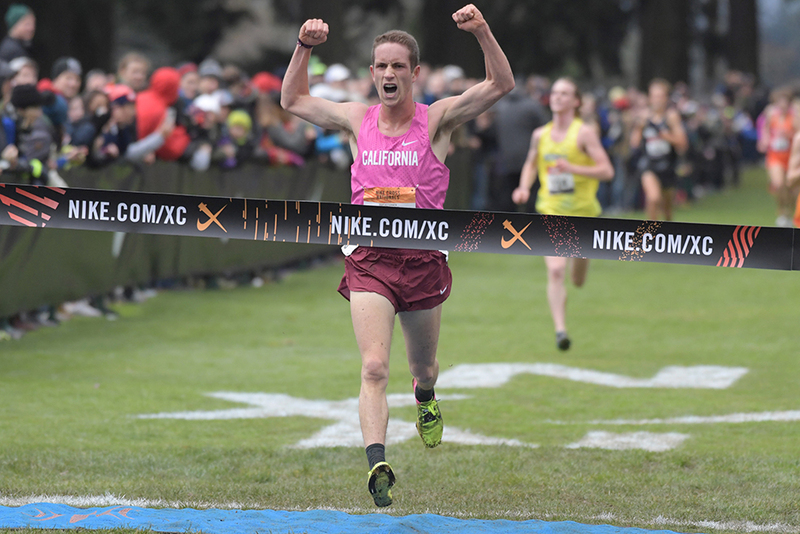 At the finish, Anderson broke the course record in 14:57.6 to become the first-ever California boy to win. Cole Hocker (Cathedral, Indianapolis) sprinted effectively to nab Sprout for 2nd, 15:00.9–15:02.7. Coach Joan Hunter’s Loudoun Valley (Purcellville, Virginia) team became the first squad to capture back-to-back titles, topping Temecula (Great Oak, California) by 37, 77–114, with Littleton, Colorado, another point back. This despite lead runner Sam Affolder running into trouble near the end. Teammate Carlos Schultz caught him before the final hill and turned around to encourage him. The two finished 30th and 31st but scored only 8 and 9 points once the individual runners were removed from the tabulation. 1. Purcellville 77; 2. Temecula 114; 3. Littleton 115; 4. Warwick 206; 5. Manlius 209; 6. Newbury Park 236; 7. American Fork 247; 8. Stevenson Ranch 283; 9. Duval 287; 10. Central Spokane 288; 11. La Costa 289; 12. Denver 296; 13. Wheaton South 307; 14. Burnt Hills 323; 15. West Kennewick 330; 16. Veradale 346; 17. Mounds View 366; 18. Lincroft 371; 19. Arlington 387; 20. Carroll 410; 21. Middleton 474; 22. Eastwood 477. 41. Zane Fodge (Northwest-1) 15:39.3; 42. Kevin Ramos (California-3) 15:40.5; 43. **Mateo Joseph (Temecula) 15:40.8; 44. Acer Iverson (Heartland-4) 15:41.7; 45. Jack McMahon (Warwick) 15:42.0; 46. *Lisandro Berry-Gaviria (Northeast-1) 15:42.7; 47. *Wil Smith (Central Spokane) 15:43.3; 48. Isaiah Seidman (Stevenson Ranch) 15:43.5; 49. Andrew Brandt (Heartland-2) 15:43.9; 50. *Caleb Niednagel (LaCosta) 15:45.1. (203 finished). 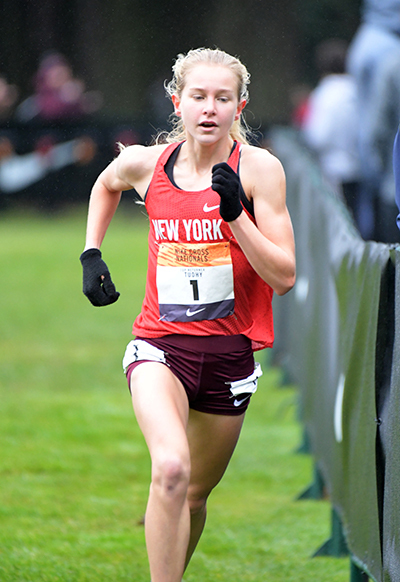 On the girls side, few doubted that Katelyn Tuohy (North Rockland, Thiells, New York) would be the one to beat. 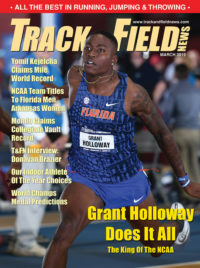 There were stories of the New York star having to fend off prerace jitters, but those concerns faded away as the precocious junior barreled out from the start, building a 60m lead by the mile (5:04). She covered the tougher middle mile in 5:26.8, but put together a strong finish to shatter her own course record by nearly 7 seconds with a 16:37.8.“I’m just so happy I can relax now,” she said. The only previous successful defender was Sarah Baxter in ’11. Now Tuohy can go for the first three-peat. The battle for the podium was lacking in the drama department, as runner-up Kelsey Chmiel (Saratoga Springs, New York) held steady in 2nd virtually the entire way, and 3rd-placer Taylor Ewert, the walks star from Beavercreek, Ohio, stayed in place as well. Chmiel, last year’s runner-up finished much closer to Tuohy this time around when she finished 40 seconds behind in 2nd. “About 2K I knew I was feeling good so I wanted to pick it up a little bit,” she said. Coach Jim McLatchie’s Summit (Bend, Oregon) squad won the team battle handily, scoring 120 to the 186 for repeat runner-up North, Naperville (Illinois), with Wayzata in 3rd at 207. Summit became the first team from the West ever to win the title. 1. Central Oregon 120; 2. North Naperville 186; 3. Wayzata 207; 4. Manlius 212; 5. Niwot 219; 6. Kinetic 228; 7. Murrieta 231; 8. Temecula 249; 9. Vail Valley 253; 10. Boise 273; 11. Portland 278; 12. Claremont 280; 13. Yorkville 284; 14. Denver 290; 15. Liverpool 297; 16. Hunterdon 315; 17. Edina 358; 18. Flower Mound 401; 19. Hinesburg 421; 20. Prosper 450; 21. Blacksburg 451; 22. Tallahassee 469. 41. ***Aubrey O’Connell (Prosper) 17:59.3; 42. ***Teaghan Knox (Central Oregon) 18:00.7; 43. ***Madeline Coles (Claremont) 18:00.9; 44. ***Jenna Mulhern (Northeast-3) 18:01.3; 45. ***Ella Kurto (Kinetic) 18:01.9; 46. Emily Nugent (Hunterdon) 18:02.7; 47. *Ashley Lajoices (Northwest-4) 18:03.0; 48. **Grace Ping (Heartland-3) 18:03.4; 49. *London Culbreath (South-2) 18:03.9; 50. **Brynn Brown (South-1) 18:05.7 (202 finished).